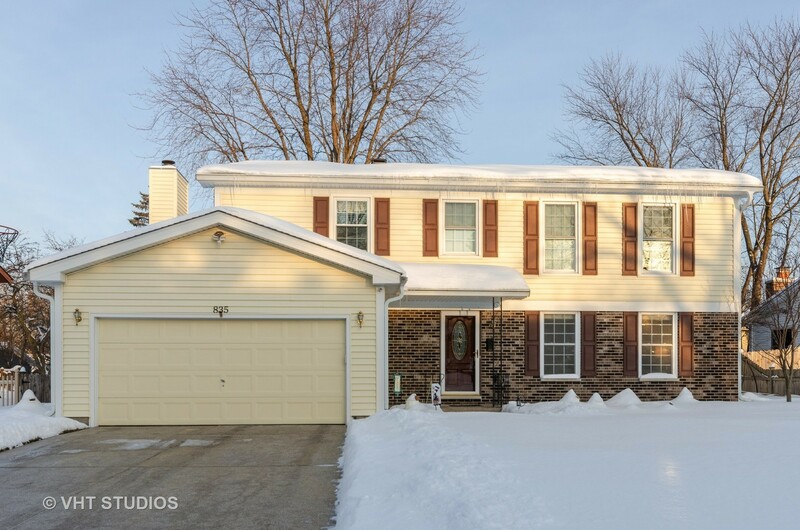 Immaculate updated 4 bedroom home! Light & bright eat-in kitchen with Pergo floors, white cabinets & quartz counters. Cozy fireplace, recessed lighting & built-in cabinets in the family room where sliders open to a large aggregate patio & fenced yard featuring gorgeous perennial gardens. A gardener&apos;s delight and great backyard for family fun & entertaining! Formal dining room & living room complete the main level. Huge master suite features an updated bathroom with walk-in shower & walk-in closet. 3 more spacious bedrooms upstairs with generous closet space. Finished basement offers a large rec room & retro bar area. There&apos;s room for all of your tools and toys in the spacious 2.5 car garage and shed. Enjoy the whimsical rock garden on the side yard! No exterior maintenance worries here...all new siding, soffits, fascia, rain guard gutters & shutters in 2012. New roof in 2015. Furnace new in 2018. Conveniently located between Randall Rd & Rt.14. In walking distance to all 3 schools!